Under conditions of changing sand-mould strength and rod diameter, hot tearing susceptibility of Mg WE43A alloys was studied using constrained rod casting solidified in a sand mould. Variations of temperature and shrinkage force with time during solidification of Mg WE43A alloy were recorded by means of a thermocouple and a force sensor. Susceptibility to hot tearing at hot section was decreased with increasing rod diameter from 10 mm to 20 mm. The rod with 10 mm diameter fractured, and the rod with 15 mm diameter presented hot tearing. No hot tearing was noted for the rod with 20 mm diameter. For the resin content of 1%, 1.5%, 2%, 2.5% and 3%, the tensile strength of sand mould was measured as 0.12, 0.18, 0.28, 0.17 and 0.15 MPa, respectively. The casting fractured at hot spot position for the sand mould with strength of 0.12 MPa. Hot tearing occurred at hot spot for the sand mould with strength of 0.15 MPa. No hot tearing was found at hot spot for the sand mould with strength of 0.28 MPa. The present research confirms that increasing the sand-mould strength and avoiding the entrapment of sand particles and the formation of gas pores during casting increase the resistance to hot tearing. 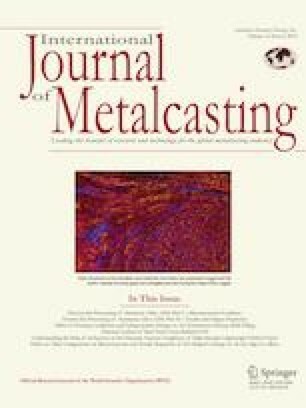 Effect of yttrium on the thermal cracking tendency of Mg-Zn-Y-Zr alloy was investigated.11 Using the “T” type casting solidified in the metal mould, authors measured cooling curves and shrinkage stress curves during solidification. The experimental results showed that the occurrence of hot tearing depended on Y concentration and there existed a specific concentration at which a peak hot tearing susceptibility was observed. 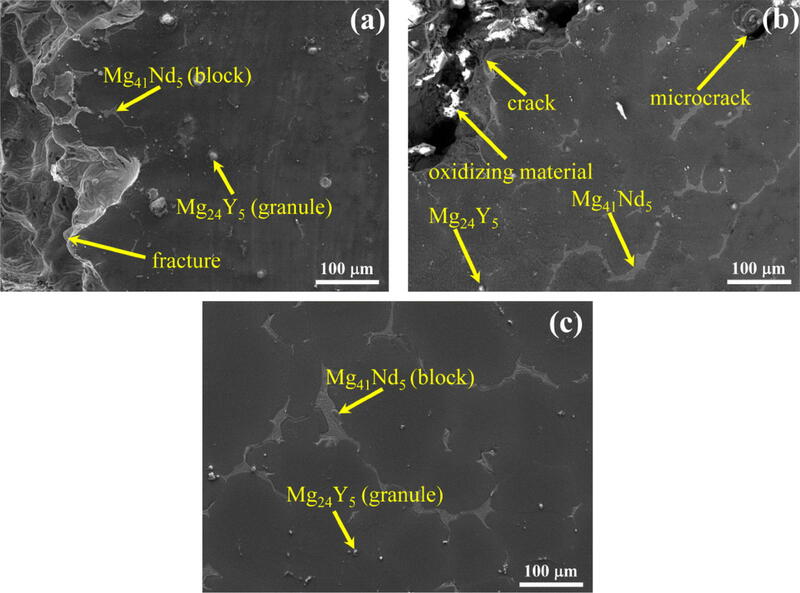 Wang et al.12 investigated the hot tearing susceptibility of binary Mg-Y alloy castings. The hot tearing susceptibility of Mg-Y alloys initially increased and then decreased with increasing Y concentration. When the content of Y was about 0.9 wt%, the hot tearing susceptibility reached its maximum. It was proposed that the influence of Y content on the hot tearing susceptibility followed the “λ” shape. The influences of pouring temperature and mould temperature on the thermal cracking sensitivity of Mg-3Nd-0.2Zn-Zr alloys were studied.13 The effect of mould temperature on thermal cracking was more significant than pouring temperature. The pouring temperature and mould temperature were optimized together to prevent hot tearing. Bichler et al.14 and Pokorny et al.15 found that the thermal cracking susceptibility of permanent mould cast AZ91D magnesium alloy was improved with the increase in mould temperature. The increase in pouring temperature in the range of 680–720 °C decreased the thermal cracking susceptibility of AZ91D alloy. 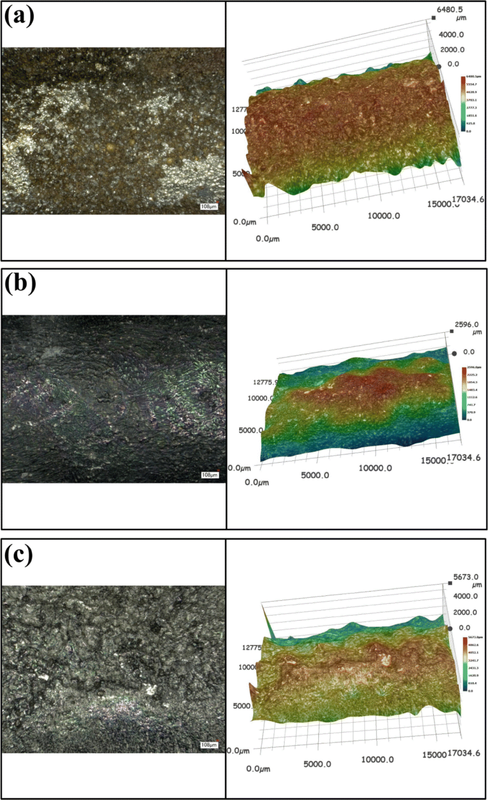 Srinivasan et al.16 analysed the hot tearing characteristics of binary Mg-Gd alloy castings. The hot tearing susceptibility first increased with Gd content until it reached the maximum at 2 wt% Gd and then decreased with further increase in Gd content. The hot tearing susceptibility also increased with decreasing the metal mould temperature. Up to now, no detailed analyses were given about the susceptibility to hot tearing of WE43A alloy. Many experimental studies have focused on investigating the influences of alloy concentrations and mould and pouring temperatures.11, 12, 13, 14, 15, 16, 17, 18, 19, 20, 21, 22 For real industrial productions, however, castings of WE43A alloys usually involve complex internal structures which are characterized as variable cross section sizes, and the casting processes are often carried out in sand moulds. Therefore, the sand-mould strength and variable cross section size are vital factors affecting the occurrence of hot tearing in WE43A alloy. In the present research, the effects of rod diameter that indicates a change in cross section and sand-mould strength on the thermal cracking behaviour of WE43A alloys were investigated. The constrained rod casting (CRC) system developed in References 23, 24, 25, 26 was modified and used. Microstructures near hot tearing section were observed. Cooling curves and force curves at the hot spots were measured to determine the temperature and shrinkage force at which hot tearing occurred. WE43A alloy studied in this work was provided by Avic Harbin Dongan Engine (Group) Corporation Ltd. The nominal composition is listed in Table 1. A cylindrical graphite crucible with a volume of 785 mm3 was used for melting. About 1.1 kg of WE43A alloy was melted in the crucible. A box-type high-temperature electrical-resistance furnace was used for melting. When the heating temperature of the furnace reached at 450 °C, a protective gas (99% CO2 + 1% SF6) was introduced into the furnace to prevent the oxidation of magnesium alloy during the melting. The pouring temperature was set at 740 °C that is approximately 87 °C above the liquidus temperature (653 °C). The liquidus and solidus temperature of WE43A is 653 °C and 538 °C, respectively, which were measured by high-temperature differential scanning calorimetry. Before casting, the melt was manually stirred for about 1 min and then held at the pouring temperature for about 30 min. The sand mould was preheated to 100 °C and maintained at 40 °C before pouring. At the same pouring temperature and mould temperature, three rods with diameters of 10 mm, 15 mm and 20 mm were cast in the sand moulds with resin content of 2% and two rods with 20 mm diameter were cast in the sand moulds with resin content of 1% and 3%. The mould temperature and pouring temperature in the present experiments were consistent with the temperatures used by Avic Harbin Dongan Engine (Group) Corporation Ltd. in actual production process of WE43A. Figure 1 shows the CRC system and sizes of casting. This system consists of a CRC cast in sand mould and a data acquisition system for measuring temperature and force during solidification.24 The rod with variable cross section was solidified. As mentioned above, the diameter of the thin part in the rod was varied in the experiments. The whole rod length (393 mm) and the diameter of the thick part (35 mm) were kept as constants. Because of an abrupt change in cross section, a “hot tearing position” was assigned, where the stress concentration was easily induced.24 Since this location was easy to crack, one K (NiCr-NiSi) type thermocouple,27 encased in the quartz tube (3 mm outer diameter), was positioned here to obtain cooling curves. In order to prevent the thermocouple from affecting the hot tearing behaviour of WE43A alloy, the inserting depth should not exceed the highest position of the thin part of CRC. So the thermocouple is fixed at the depth of 2 mm in the cavity. The relative accuracy of the temperature measurement is approximately 1 °C. Schematic diagram of (a) CRC experimental set-up and (b) rod. All dimensions in mm. A BK-2Y force sensor was fixed on the mould to measure the variations of shrinkage force with time. Computer-based data acquisition system (BenchLink Data Logger 3, Agilent Technologies) and ADAM4000 microprocessor set were used to record the temperature curves and force curves during solidification, respectively. The time step for the measurements of temperature and shrinkage force is 0.5 s.
The working theory of CRC system is briefly explained. One threaded steel rod (5 mm diameter) on the left side connects the force sensor with the solidifying casting. Another threaded steel rod (5 mm diameter) on the right side connects the casting with the steel support plate to ensure that the thick part of rod cannot move during solidification. After the superheated melt is poured into the cavity, the solidification rate of thin part is faster than that of thick part. As a consequence, the shrinkage stress in the thin part is larger than that in the thick part. That is to say, the thin part imposes a tensile force to the thick part. Since the rod has a variable cross section, the thick part is kept from free contraction during solidification due to the obstruction from the mould. When the tensile force is larger than the surface tension of interdendritic liquid film, the cracking would be induced at the junction between the thin part and the thick part. In this process, at the assigned hot tearing position, the data of contraction force and temperature are transmitted to the computer by the force sensor and the thermocouple. Resin sand moulds were used in the present experiments which consisted of resin, curing agent and quartz sand. The sand-mould strength was controlled by the resin content. Five sets of “8” shape resin sand samples were prepared with resin contents of 1%, 1.5%, 2%, 2.5% and 3%, respectively, and with the same amount of quartz sand (160 g). With the same resin content, each set included three samples. All these samples were put into the furnace at 100 °C for 1 h. Tensile strength was measured by a tensile testing machine. For each set of samples, a mean value of strength was calculated. For the resin content of 1%, 1.5%, 2%, 2.5% and 3%, the mean tensile strength was 0.12, 0.18, 0.28, 0.17 and 0.15 MPa, respectively. When the added amount of resin exceeded 2%, the mould strength decreased. The reaction rate between the resin and curing agent increases with the increase in resin content, which causes the crosslinking structure of resin to become incomplete.28 Then, the strength of sand mould was weakened. In the following study, the sand moulds with 1%, 2% and 3% resin were considered. Samples of WE43A alloy were cut from hot tearing positions and characterized using scanning electron microscopy (SEM). A standard metallurgical technique was used for as-cast microstructure observation.29 Each sample section was grinded using 200, 400, 600, 800 and 2000 grid SiC papers and then were mechanically polished. Afterwards, a mixture of nitric acid (4%) and ethyl alcohol (96%) was used to etch the specimens for about 30 s in order to reveal the microstructure. Figure 2 shows photographs of different sized rods. With increasing the rod diameter, the hot tearing susceptibility of WE43A alloys decreased. In Figure 2a, CRC with diameter of 10 mm has the fracture behaviour: the thin rod completely fell off. In Figure 2b, an obvious cracking occurred not only on the surface, but also extended inward. The cracking width was about 2.5 mm and the depth about 2 mm. For the rod with diameter of 20 mm, no cracking was observed. Photographs of as-cast rods of WE43A alloy taken near the hot tearing position: (a) 10-mm-diameter rod; (b) 15-mm-diameter rod; (c) 20-mm-diameter rod. Figure 3 shows the SEM images of WE43A alloys taken near the hot tearing positions of three rods with the diameters of 10, 15 and 20 mm. In our previous research,30 it has been studied that the microstructure of WE43A consists of primary α-Mg, eutectic Mg41Nd5 (block type) and eutectic Mg24Y5 (granule type). The larger block-type eutectic Mg41Nd5 phases mainly exist at the grain boundaries and are easily fractured in the process of applying force. So, the hot tearing tends to occur around Mg41Nd5 phases. The smaller granule-type eutectic Mg24Y5 phases mainly exist in the matrix. Due to the smaller volume, their influences on the hot tearing are negligible. For the 10-mm-diameter rod (Figure 3a), a total breaking at hot tearing position was noted. For the 15-mm-diameter rod (Figure 3b), hot tearing was observed, but the rod was not fractured. No hot tearing was found in the 20-mm-diameter rod (Figure 3c). Figure 4 shows the SEM image of fracture surface for the 10-mm-diameter rod. Tearing ridges are noted on the fracture surface with a small amount of shrinkage porosity. A smaller rod diameter indicates a greater change in cross section. Then, a larger stress concentration was created at the junction position and the junction position tends to crack. SEM images of microstructures taken near the hot tearing position: (a) 10-mm-diameter rod; (b) 15-mm-diameter rod; (c) 20-mm-diameter rod. SEM images of fracture surface for 10-mm-diameter rod. The liquidus and solidus of WE43A alloy were measured as 653 °C and 538 °C, respectively. Freezing temperature range is 115 °C. In Figure 5, the average cooling rates in the freezing range are calculated. For the rods with diameters of 10, 15 and 20 mm, the average cooling rate is 1.6, 1.3 and 1.2 °C s−1, respectively. In a smaller diameter rod, during faster solidification, dendrites developed quickly and mushy zone was cut off from the liquid feeding in an earlier time. 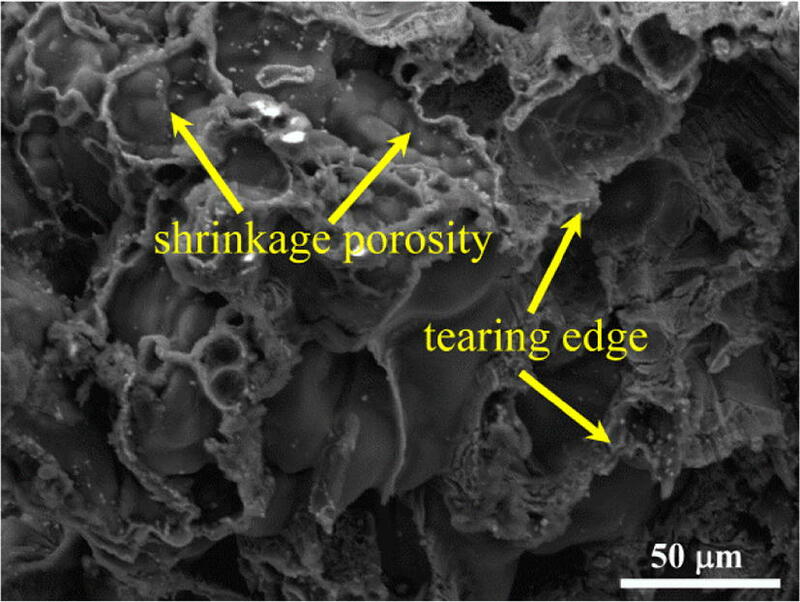 Since the feeding liquid was not available, porosity formed in the semisolid region. It was the initiation site for the hot tearing. When a tension induced by the obstructed contraction became high enough, the hot tears were formed under tensile loading. It is often accepted that a refined microstructure reduced the susceptibility of alloy to hot tearing.31 In the present experiment, the 10-mm rod showed a finer microstructure (Figure 3a). However, it also had a larger area ratio of different sections. For the casting with the abrupt change in the cross section, the geometrical effect is more significant than microstructural effect. 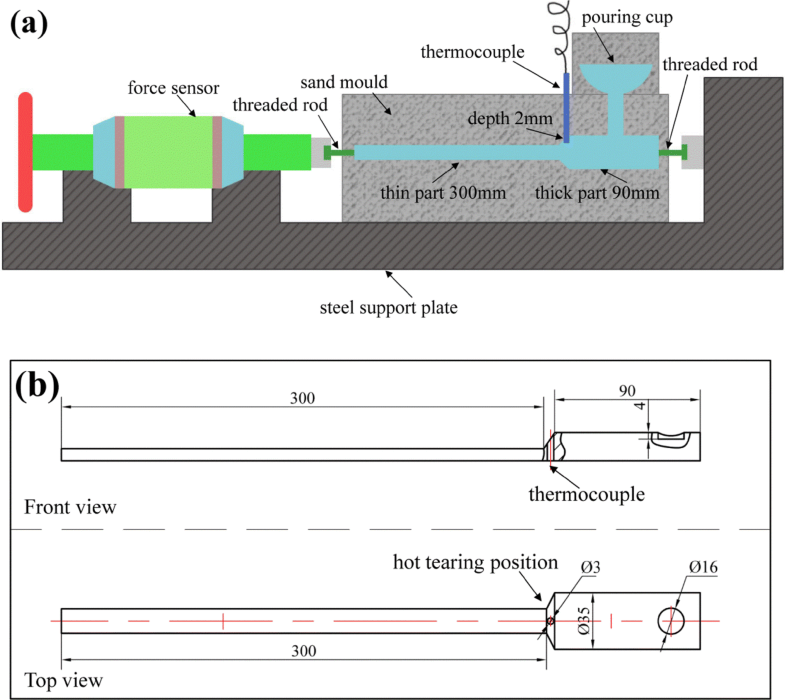 Temperature–force–time curves obtained from instrumented CRC experiment: (a) 10-mm-diameter rod, a total breaking at hot tearing position; (b) 15-mm-diameter rod, only hot tearing at hot tearing position; (c) 20-mm-diameter rod, no hot tearing. Figure 5 shows both temperature versus time curves and force versus time curves. The force represents the tensile force formed in the constrained rod due to the thermal contraction and solidification shrinkage during casting. The thermocouple used to record the cooling curve was placed at the junction of the thin part and the thick part which was considered as the hot spot location where hot tearing occurred. Therefore, the onset of hot tearing can be determined by analysing the temperature–force–time curves. In Figure 5a, the force rises to 123.9 N at 12.3 s and then experiences a decrease. This decrease in the force indicates that the occurrence of cracking interrupts the continuous development of tension in the rod and causes the strength of solidifying material to drop. The presence of the peak in the force curve determines the onset temperature and time of hot tearing as 643.9 °C and 12.3 s. After about 23 s, another peak (265.3 N at 35.8 s) in the force curve shows up. The corresponding temperature is 598.2 °C. This suggests that the incipient cracking occurred at 12.3 s may be healed during the following solidification and the cracking came into being again at 35.8 s. After the second peak, the force increases with time slowly and smoothly and climbs to about 370 N at 210 s. In Figure 5b, with increasing rod diameter from 10 to 15 mm, no peaks are noted on the force curve and a load platform is detected which initiates at 39.3 s and ends at 43.8 s. The temperature at 39.3 s is 610.4 °C representing the onset temperature of hot tearing. The observed platform suggests that the degree of hot tearing is not serious. When tension in the solidifying rod is only temporarily relieved, the force rise is briefly arrested, leading to a small plateau.23 After the platform, the force increases to nearly 1365 N at 210 s. In Figure 5c, for the rod with diameter 20 mm, vibrations with small degree are observed on the force curve. During solidification, the hot tearing occurs and then is quickly healed. Due to the higher liquid fraction at the beginning of solidification, there is liquid feeding between dendrites.17 The damaged area is healed by enough liquid feeding. As the solidification continues, the solid fraction of alloy increases. Since the matrix becomes stronger, the shrinkage force obviously increases at the later stage of solidification. In fact, no cracking was detected in this 20-mm-diameter rod. The effects of rod diameter on hot tearing behaviour of WE43 alloy are that compared to thinner rod, thicker rod presents a lower cracking susceptibility. So, the casting with a smaller change in cross section area would not be easier to crack. The influences of sand-mould strength on the susceptibility of rod to hot tearing are studied. Table 2 lists the strength of sand moulds and the degree of metal penetration for moulds with different resin contents. The thickness of sand mould remains unchanged at 160 mm. The rod diameter for the thin part was 20 mm for each case. Figure 6 shows photographs of alloy rods cast in the sand moulds with different resin contents. It can be seen that the resin content had an obvious influence on hot tearing. For the resin content of 1%, CRC presented fracture behaviour. For the resin content of 2%, no fracture happened on CRC. Although the cracking was clearly observed near the hot spot of CRC cast in the sand mould with 3% resin content, the rod was not fractured. The width of cracking was measured as 1 mm and the depth 0.5 mm. Photographs of as-cast rods of WE43A alloy taken near the hot tearing position: (a) 1% phenolic resin; (b) 2% phenolic resin; (c) 3% phenolic resin. Furthermore, from Figure 6, we can also notice the degree of metal penetration as a function of sand-mould hardness. In Figure 6a, as the rod outer surface was totally covered by sand particles, the metal penetration is the most serious. And these sand particles were hard to be removed. In order to clearly observe the surface finish of final rod, the VHX-1000 digital microscope was used. Figure 7 shows surface roughness of CRC with different resin contents taken near the hot tearing position. The left half is two-dimensional topography, and the right half is three-dimensional surface morphology with measured maximum contour height. In Figure 7a, many sand particles on the rod surface were noted and the maximum contour height reached to 6480 μm. In Figure 7b, the surface roughness of casting becomes smooth. The maximum contour height was 2596 μm. In Figure 7c, the surface of casting becomes rougher again. The maximum contour height was 5673 μm. Images of rod surfaces (left) and measured values of surface finish (right): (a) 1% phenolic resin; (b) 2% phenolic resin; (c) 3% phenolic resin. A smaller amount of resin added results in a low strength of sand mould. Sand particles existing on cavity and/or straight sprue inner surfaces are easily entrapped into the liquid during filling to form inclusion defects. Those inclusions would result in stress concentrations at some sharp points and initiate cracking. In Figure 8a, some inclusions are observed which are embedded within the dendritic network. A total breaking at the hot spot was noted. For the case of 2% resin content, the sand-mould strength is increased and the adhesion between sand particles is enhanced. As no sand particles were involved into the cavity during filling to form inclusion defects, Figure 3c already showed the evidence of the least cracking. For the case of 3% resin, the sand-mould strength is decreased again. The rod was not broken and only hot tearing was observed (Figure 8b). At high temperatures, the added resin leads to the gas releasing from the mould. In Figure 8c, in the area on the right of the hot spot, both tiny gas pores and slag inclusion are noted. These gas pores behave as spherical notches and reduce the surface tension of liquid film, initiating cracking in the hot section during solidification. Figure 9 shows the fracture surface for 1% resin. In comparison with Figure 4 in which the fracture also happened, the tearing edges decrease in Figure 9. This is because the solidifying rate is relatively slow in Figure 9. The undercooling of melt decreases with decreasing solidification rate. Then, the undercooling at this point provides a lower driving force for nucleation, which reduces the nucleation rate of the alloy. The grain size becomes even larger. So the ability of dendrites to resist shrinkage force has been worse. Therefore, these liquid films between grains are more easily torn during solidification. SEM images of WE43A alloys taken near the hot tearing position in the sand moulds with different strengths: (a) 1% phenolic resin; (b) 3% phenolic resin; (c) 3% phenolic resin. 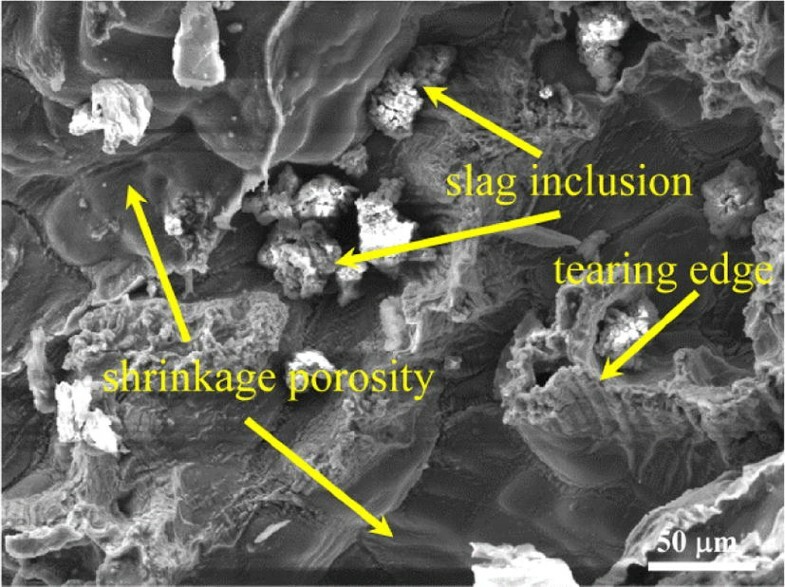 SEM images of fracture surface for 1% phenolic resin. Figure 10 gives both temperature versus time and force versus time curves for castings produced with different sand resin contents. In Figure 10a, a peak at 14.3 s exists in the force curve. The temperature at which hot tearing occurs is 641.9 °C. The average cooling rate deduced from the cooling curve is 1.1 °C s−1. In Figure 10b, a peak at 111.1 s is noted in the force curve. Compared to Figure 10a, the onset temperature of hot tearing is decreased to 574.1 °C. The average cooling rate is 1.0 °C s−1. Changing the resin content in sand moulds did not modify the thermo-physical properties of moulds, and thus, the heat transfer process in the casting was barely affected. The obvious difference in the onset temperature and time between the two castings solidified in the moulds with resin contents of 1% and 3% is due to what kind of defects formed, inclusions or gas pores. In the present study, the entrapment of sand particles as in the case of sand mould with 1% resin makes the alloy more susceptible to hot tearing. 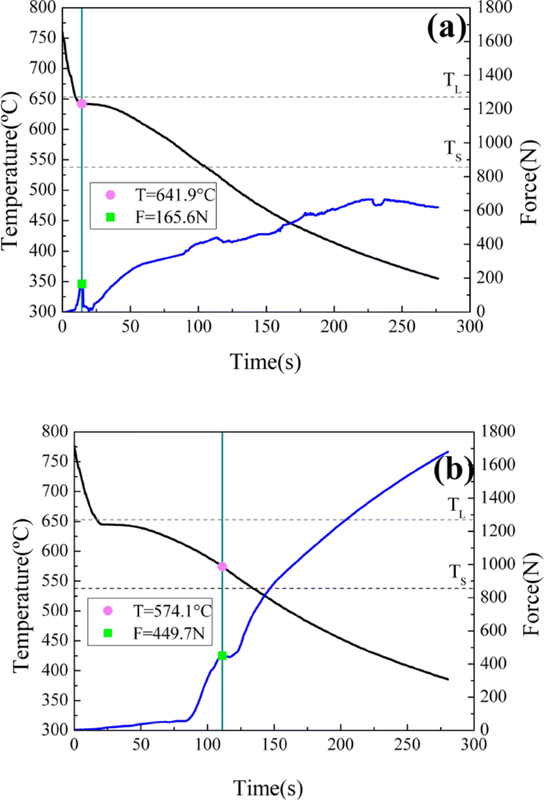 Temperature–force–time curves obtained from instrumented CRC experiment for the sand moulds with different strengths: (a) 1% phenolic resin, a total breaking at hot tearing position; (b) 3% phenolic resin, only crack at hot tearing position. 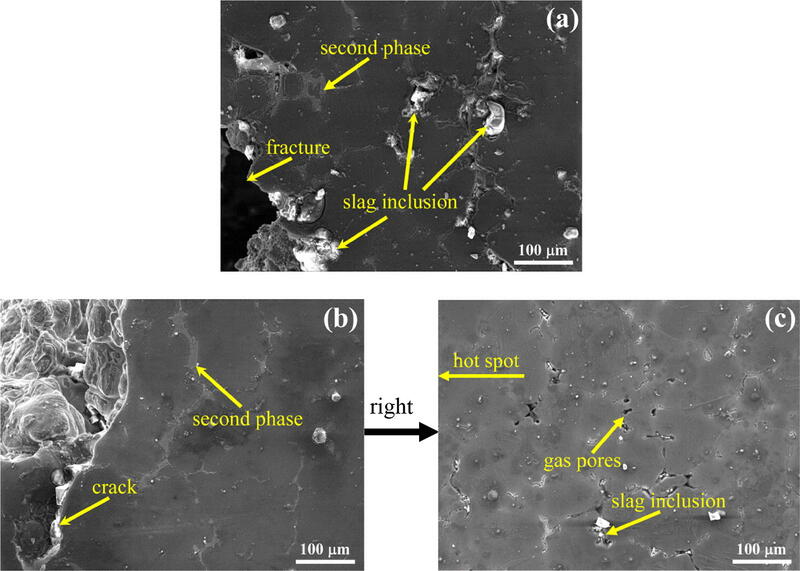 The effects of rod diameter and the sand-mould strength on the thermal crack behaviour of WE43A alloy was studied by analysing the microstructures, fracture surfaces and temperature–force–time curves recorded during solidification. The order of hot tearing susceptibility is CRC (10 mm fractured) > CRC (15 mm with hot tearing) > CRC (20 mm without hot tearing). Compared to CRC with 15-mm-diameter rod, CRC with 10-mm-diameter rod showed a higher onset temperature and an earlier time of hot tearing, 643.9 °C/12.3 s (as opposed to 610.4 °C/39.3 s) and two peaks in the force rise. A larger variation in cross section area leads to a severer hot tearing at hot spot. For different sand-mould strengths, the order of hot tearing susceptibility is CRC (0.12 MPa fractured) > CRC (0.15 MPa with hot tearing) > CRC (0.28 MPa without hot tearing). For sand mould with lower strength, two situations may be met. Sand particles floating away from sand-mould surfaces during filling result in inclusion defects. Gas released from the excessively added resin results in gas pore defects. All these defects lower down the resistance to hot tearing, and inclusion defect is more harmful. The authors acknowledge financial support from the National Natural Science Foundation of China (Grant No. 51674094) and Natural Science Foundation of Heilongjiang Province (Grants No. E2017054).